NASCAR Sprint Cup, Xfinity, Camping World Truck Series updates, including dirt track racing and other motorsports series. No. 55 Aaron’s Dream Machine Toyota driver Mark Martin returns to Daytona International Speedway Wednesday in preparation for Thursday’s Daytona Duels that set the starting field for Sunday’s running of the 55th annual Daytona 500. Martin will start 14th in the second Duel on Thursday. It’s been a tough Speedweeks so far for the No. 55 Michael Waltrip Racing team. The team wrecked in Friday practice and during Saturday’s Sprint Unlimited. Martin said despite the introduction of the new Gen-6 cars this season, there are no worries about having enough cars for this week. DAYTONA 500: “I’m not superstitious and I don’t believe in lucky charms or anything like that. In fact, I avoid all that stuff. But I have noticed this is the 55th Daytona 500 and the No. 55 is a pretty cool number, don’t you think? · 2013 & 2014 PLANS: Martin will drive the No. 55 in 24 points races and two non-points races in 2013 for Michael Waltrip Racing. Martin said he has yet to determine his 2014 plans, but emphasizes he isn’t going away from MWR or NASCAR. · No. 55 DRIVERS: Martin will drive the No. 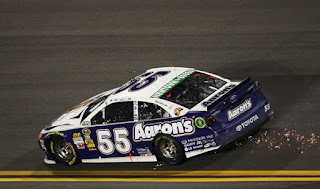 55 in 24 races, Brian Vickers in nine races and Michael Waltrip in three races. · DAYTONA: In 54 Sprint Cup starts at Daytona Martin owns nine top-five finishes. He’s led 273 laps and won the three poles including the 2010 Daytona 500. Daytona, Homestead, Indianapolis, Pocono and Kentucky are the only active Sprint Cup tracks where Martin has yet to win. Martin owns Cup victories at 20 different tracks. Martin won the 1999 Sprint Unlimited and 2006 truck race at Daytona. · WINS: Martin owns 40 Sprint Cup, 49 Nationwide and seven Camping World Truck Series victories. He’s led 12,781 laps in Sprint Cup competition. Martin has started 854 Sprint Cup races, 236 Nationwide races and 25 truck events. He also owns 13 IROC wins in 47 starts. · MWR IN 2012: MWR’s five Sprint Cup Series drivers scored three wins (Clint Bowyer at Sonoma, Richmond and Charlotte), 24 top-five and 58 top-10 finishes in 2012. MWR drivers led 1,198 laps. Bowyer finished second and Martin Truex Jr. 11 in NASCAR’s Chase for the Sprint Cup. Truex led 434 laps led, Bowyer 388, Martin 197, Vickers 158 and Waltrip 21. Brian Vickers to Replace Tony Stewart at Daytona?